Release of Debtor by Assignor. Loss of Right to Release. Form of Deed of Assignment. According to common law, "the transferring and setting over to another of some right, title, or interest in things in which a third party, not a party to the assignment, has a concern and interest" (J. Bacon's "Abridgment," p. 329). Strictly speaking, according to Jewish law there can be no Assignment of claims or rights in a thing, but only an Assignment of the thing itself (ShulḦan 'Aruk, Ḥoshen Mishpaṭ, 66, 1). In this respect the early Jewish law and the common law agree, although they differ in their reason for the rule. The common law assigns as a reason that to allow the granting or Assignment of a "chose in action" (a right to receive, or recover a debt, or money, which can not be enforced without action) to a third personwould be the occasion of multiplying contentions and suits. 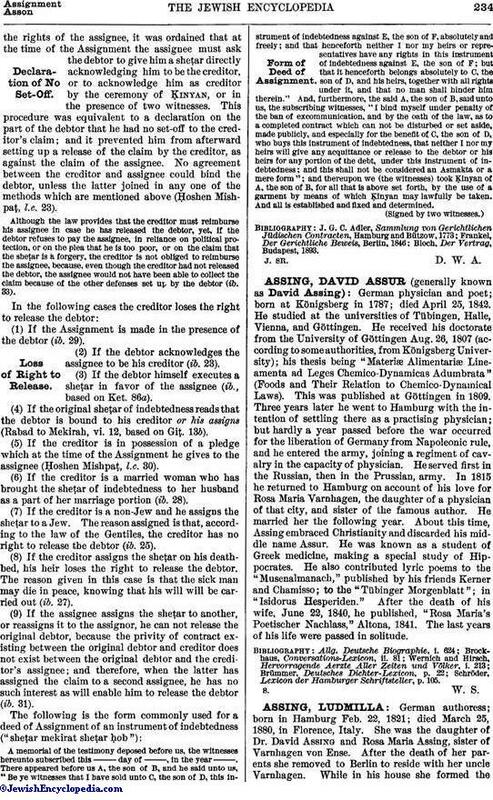 According to the Jewish law, the relation of debtor and creditor gives the latter rights against the person of the former (jus in personam) secured by rights against his property (jus in rem). 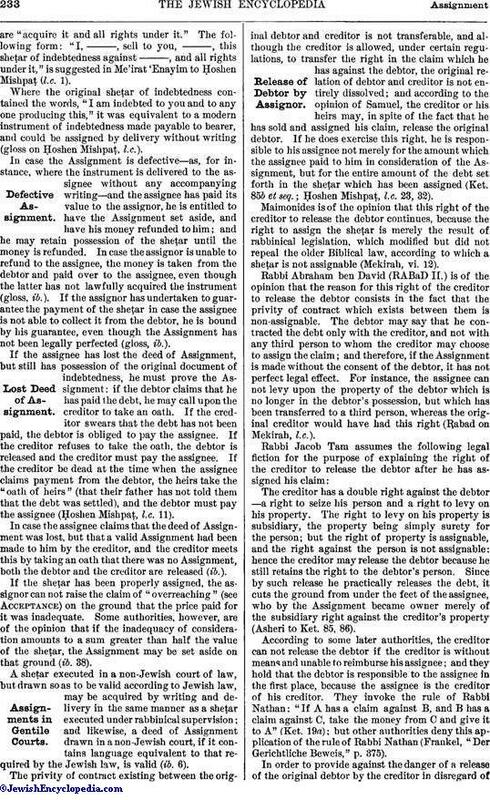 The right of the creditor to seize the person of the debtor can not be assigned; and the debtor is justified in resisting the claim of the creditor's assignee, upon the ground that he, the debtor, was willing to give his creditor certain rights against his person which he would have refused to give to the creditor's assignee (Me'irat 'Enayim to Ḥoshen Mishpaṭ, l. c. 23). Originally a "sheṭar" (an instrument in Writing) of indebtedness was not assignable, according to Biblical law, because it is not a thing, but merely evidence of a right (Maimonides, "Yad," Mekirah, vi. 12). With the beginning, however, of commercial life, the strictness of this ancient rule of law had to be modified. Therefore, if the Assignment of the claim was made by the creditor in the presence of the debtor and assented to by him, it was valid (Giṭ. 13b). This rule, however, was felt to be a concession, and could not be used as a basis for the further extension of this principle (Mekirah, vi. 8). If the debt which had thus been assigned in the presence of all three parties interested was secured by a sheṭar, it was held, even by the later authorities, that, although the Assignment was valid, the assignee could not compel the creditor to deliver the sheṭar to him (Ḥoshen Mishpaṭ, l.c. 19); although if the debtor paid the assignee, he (the debtor) could compel the creditor to surrender the sheṭar (ib.). The sheṭar of indebtedness can be assigned only by "writing and delivery"; that is to say, it must be delivered by the creditor to his assignee together with another instrument in writing, setting forth the fact of the Assignment (ib. 1; and see the cases mentioned in §§ 2, 3, 4, 5, 13). 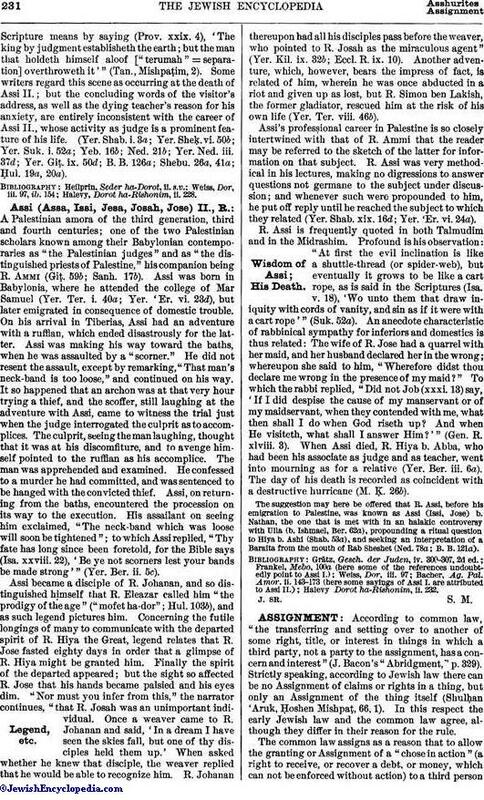 This question was debated in the Talmud; and the opinions of the authorities differed to such an extent that the question as to what constituted a valid Assignment was long left in doubt. Rabbi Judah ha-Nasi was of the opinion that the mere delivery constituted a valid Assignment of the sheṭar (Sanh. 31a); and the amora Amemar was of the same opinion (B. B. 77a). The majority of the sages, however, were of the opinion that a sheṭar could not be legally assigned without writing (ib. 76a), the reason for which is given by Rab Ashi, who called attention to the fact that there was a great difference between the sheṭar of indebtedness and other things, because a sheṭar is, after all, only a promise to pay—mere words—and "words can not be acquired by words": they must be written down (ib. 77a). According to Rab Papa, the instrument of Assignment must contain these words, "acquire it [the sheṭar of indebtedness] and all rights under it" (Ḳid. 47b). Maimonides sums up the matter thus: A sheṭar of indebtedness can not be assigned merely by delivery to the assignee, because the sheṭar is simply evidence of a debt; it is not the thing itself; and "evidence" can not be lawfully acquired by the process of manual seizure (Mekirah, vi. 10). The mere intention, therefore, to transfer or assign a claim or contract, and the actual delivery of the instrument, which was the best evidence of the claim or contract, do not suffice to give the assignee title; and the law required a formal Assignment in writing. Thus, early in the Talmudic era are encountered the underlying principles of the law relating to negotiable instruments which occupies so large a part of modern legal systems, and has such an important bearing on modern commercial activity. In the case of a sheṭar of pledge, where the debtor has given the creditor possession of a piece of land as a pledge or security for a debt (the creditor to repay himself out of the fruits of the land), and has accompanied the delivery of the land by an instrument setting forth the debt and the fact that the land is pledged for it, this instrument or sheṭar may be assigned in the same manner as a simple sheṭar of indebtedness. This rule, however, was modified by the Geonim to this extent, that if the creditor gives the assignee a written instrument setting forth the Assignment, and also gives him possession of the pledged, or, as we should say in modern legal phraseology, mortgaged land, the Assignment is valid even though he retain possession of the original sheṭar of pledge (Ḥoshen Mishpaṭ, l.c. 8). In the case where movable property is pledged for the debt, the rule is still further modified, so that the debt may be assigned simply by transferring to the assignee possession of the movables pledged; and this constitutes a valid Assignment of the debt, even though the sheṭar of pledge be not delivered or any instrument in writing given to the assignee (ib.). A woman who owns a sheṭar and who afterward marries and delivers the sheṭar to her husband as part of her marriage portion, need not execute an instrument of Assignment to him (ib. 12). Where a sheṭar of indebtedness is assigned by the creditor on his death-bed, the usual formalities are dispensed with (ib. 42). 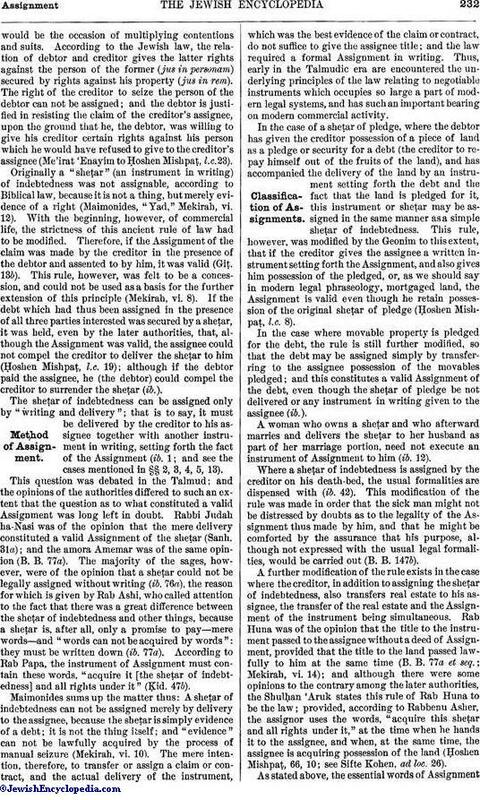 This modification of the rule was made in order that the sick man might not be distressed by doubts as to the legality of the Assignment thus made by him, and that he might be comforted by the assurance that his purpose, although not expressed with the usual legal formalities, would be carried out (B. B. 147b). A further modification of the rule exists in the case where the creditor, in addition to assigning the sheṭar of indebtedness, also transfers real estate to his assignee, the transfer of the real estate and the Assignment of the instrument being simultaneous. Rab Huna was of the opinion that the title to the instrument passed to the assignee without a deed of Assignment, provided that the title to the land passed lawfully to him at the same time (B. B. 77a et seq. ; Mekirah, vi. 14); and although there were some opinions to the contrary among the later authorities, the ShulḦan 'Aruk states this rule of Rab Huna to be the law; provided, according to Rabbenu Asher, the assignor uses the words, "acquire this sheṭar and all rights under it," at the time when he hands it to the assignee, and when, at the same time, the assignee is acquiring possession of the land (Ḥoshen Mishpaṭ, 66, 10; see Sifte Kohen, ad loc. 26). As stated above, the essential words of Assignmentare "acquire it and all rights under it." The following form: "I, _____, sell to you, _____, this sheṭar of indebtedness against _____, and all rights under it," is suggested in Me'irat 'Enayim to Ḥoshen Mishpaṭ (l.c. 1). Where the original sheṭar of indebtedness contained the words, "I am indebted to you and to any one producing this," it was equivalent to a modern instrument of indebtedness made payable to bearer, and could be assigned by delivery without writing (gloss on Ḥoshen Mishpaṭ, l.c.). In case the Assignment is defective—as, for instance, where the instrument is delivered to the assignee without any accompanying writing—and the assignee has paid its value to the assignor, he is entitled to have the Assignment set aside, and have his money refunded to him; and he may retain possession of the sheṭar until the money is refunded. In case the assignor is unable to refund to the assignee, the money is taken from the debtor and paid over to the assignee, even though the latter has not lawfully acquired the instrument (gloss, ib.). If the assignor has undertaken to guarantee the payment of the sheṭar in case the assignee is not able to collect it from the debtor, he is bound by his guarantee, even though the Assignment has not been legally perfected (gloss, ib.). If the assignee has lost the deed of Assignment, but still has possession of the original document of indebtedness, he must prove the Assignment: if the debtor claims that he has paid the debt, he may call upon the creditor to take an oath. If the creditor swears that the debt has not been paid, the debtor is obliged to pay the assignee. If the creditor refuses to take the oath, the debtor is released and the creditor must pay the assignee. If the creditor be dead at the time when the assignee claims payment from the debtor, the heirs take the "oath of heirs" (that their father has not told them that the debt was settled), and the debtor must pay the assignee (Ḥoshen Mishpaṭ, l.c. 11). In case the assignee claims that the deed of Assignment was lost, but that a valid Assignment had been made to him by the creditor, and the creditor meets this by taking an oath that there was no Assignment, both the debtor and the creditor are released (ib.). If the sheṭar has been properly assigned, the assignor can not raise the claim of "overreaching" (see Acceptance) on the ground that the price paid for it was inadequate. Some authorities, however, are of the opinion that if the inadequacy of consideration amounts to a sum greater than half the value of the sheṭar, the Assignment may be set aside on that ground (ib. 38). A sheṭar executed in a non-Jewish court of law, but drawn so as to be valid according to Jewish law, may be acquired by writing and delivery in the same manner as a sheṭar executed under rabbinical supervision; and likewise, a deed of Assignment drawn in a non-Jewish court, if it contains language equivalent to that required by the Jewish law, is valid (ib. 6). The privity of contract existing between the original debtor and creditor is not transferable, and although the creditor is allowed, under certain regulations, to transfer the right in the claim which he has against the debtor, the original relation of debtor and creditor is not entirely dissolved; and according to the opinion of Samuel, the creditor or his heirs may, in spite of the fact that he has sold and assigned his claim, release the original debtor. If he does exercise this right, he is responsible to his assignee not merely for the amount which the assignee paid to him in consideration of the Assignment, but for the entire amount of the debt set forth in the sheṭar which has been assigned (Ket. 85b et seq. ; Ḥoshen Mishpaṭ, l.c. 23, 32). Maimonides is of the opinion that this right of the creditor to release the debtor continues, because the right to assign the sheṭar is merely the result of rabbinical legislation, which modified but did not repeal the older Biblical law, according to which a sheṭar is not assignable (Mekirah, vi. 12). Rabbi Abraham ben David (RABaD II.) is of the opinion that the reason for this right of the creditor to release the debtor consists in the fact that the privity of contract which exists between them is non-assignable. The debtor may say that he contracted the debt only with the creditor, and not with any third person to whom the creditor may choose to assign the claim; and therefore, if the Assignment is made without the consent of the debtor, it has not perfect legal effect. For instance, the assignee can not levy upon the property of the debtor which is no longer in the debtor's possession, but which has been transferred to a third person, whereas the original creditor would have had this right (Rabad on Mekirah, l.c.). The creditor has a double right against the debtor —a right to seize his person and a right to levy on his property. The right to levy on his property is subsidiary, the property being simply surety for the person; but the right of property is assignable, and the right against the person is not assignable: hence the creditor may release the debtor because he still retains the right to the debtor's person. Since by such release he practically releases the debt, it cuts the ground from under the feet of the assignee, who by the Assignment became owner merely of the subsidiary right against the creditor's property (Asheri to Ket. 85, 86). According to some later authorities, the creditor can not release the debtor if the creditor is without means and unable to reimburse his assignee; and they hold that the debtor is responsible to the assignee in the first place, because the assignee is the creditor of his creditor. They invoke the rule of Rabbi Nathan: "If A has a claim against B, and B has a claim against C, take the money from C and give it to A" (Ket. 19a); but other authorities deny this application of the rule of Rabbi Nathan (Frankel, "Der Gerichtliche Beweis," p. 375). In order to provide against the danger of a release of the original debtor by the creditor in disregard ofthe rights of the assignee, it was ordained that at the time of the Assignment the assignee must ask the debtor to give him a sheṭar directly acknowledging him to be the creditor, or to acknowledge him as creditor by the ceremony of Ḳinyan, or in the presence of two witnesses. This procedure was equivalent to a declaration on the part of the debtor that he had no set-off to the creditor's claim; and it prevented him from afterward setting up a release of the claim by the creditor, as against the claim of the assignee. No agreement between the creditor and assignee could bind the debtor, unless the latter joined in any one of the methods which are mentioned above (Ḥoshen Mishpaṭ, l.c. 23). Although the law provides that the creditor must reimburse his assignee in case he has released the debtor, yet, if the debtor refuses to pay the assignee, in reliance on political protection, or on the plea that he is too poor, or on the claim that the sheṭar is a forgery, the creditor is not obliged to reimburse the assignee, because, even though the creditor had not released the debtor, the assignee would not have been able to collect the claim because of the other defenses set up by the debtor. (1) If the Assignment is made in the presence of the debtor (ib. 29). (2) If the debtor acknowledges the assignee to be his creditor (ib. 23). (3) If the debtor himself executes a sheṭar in favor of the assignee (ib., based on Ket. 86a). (4) If the original sheṭar of indebtedness reads that the debtor is bound to his creditor or his assigns (Rabad to Mekirah, vi. 12, based on Giṭ. 13b). (5) If the creditor is in possession of a pledge which at the time of the Assignment he gives to the assignee (Ḥoshen Mishpaṭ, l.c. 30). (6) If the creditor is a married woman who has brought the sheṭar of indebtedness to her husband as a part of her marriage portion (ib. 28). (7) If the creditor is a non-Jew and he assigns the sheṭar to a Jew. The reason assigned is that, according to the law of the Gentiles, the creditor has no right to release the debtor (ib. 25). (8) If the creditor assigns the sheṭar on his deathbed, his heir loses the right to release the debtor. The reason given in this case is that the sick man may die in peace, knowing that his will will be carried out (ib. 27). (9) If the assignee assigns the sheṭar to another, or reassigns it to the assignor, he can not release the original debtor, because the privity of contract existing between the original debtor and creditor does not exist between the original debtor and the creditor's assignee; and therefore, when the latter has assigned the claim to a second assignee, he has no such interest as will enable him to release the debtor (ib. 31). A memorial of the testimony deposed before us, the witnesses hereunto subscribed this _____ day of _____, in the year _____. There appeared before us A, the son of B, and he said unto us, "Be ye witnesses that I have sold unto C, the son of D, this instrument of indebtedness against E, the son of F, absolutely and freely; and that henceforth neither I nor my heirs or representatives have any rights in this instrument of indebtedness against E, the son of F; but that it henceforth belongs absolutely to C, the son of D, and his heirs, together with all rights under it, and that no man shall hinder him therein." And, furthermore, the said A, the son of B, said unto us, the subscribing witnesses, "I bind myself under penalty of the ban of excommunication, and by the oath of the law, as to a completed contract which can not be disturbed or set aside, made publicly, and especially for the benefit of C, the son of D, who buys this instrument of indebtedness, that neither I nor my heirs will give any acquittance or release to the debtor or his heirs for any portion of the debt, under this instrument of indebtedness; and this shall not be considered an Asmakta or a mere form"; and thereupon we (the witnesses) took Ḳinyan of A, the son of B, for all that is above set forth, by the use of a garment by means of which Ḳinyan may lawfully be taken. And all is established and fixed and determined. Bloch, Der Vertrag, Budapest, 1893.